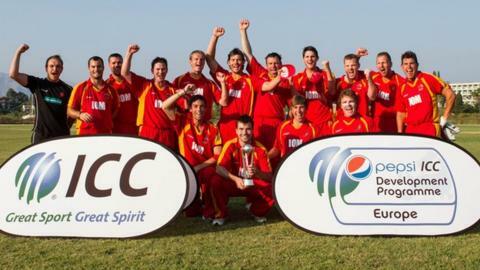 Isle of Man coach Gareth Dawson has described promotion to ICC European Division One as "massive for Manx cricket". They were automatically promoted on Friday after reaching the semi-finals at the Division Two tournament in Corfu. Dawson's side subsequently went on to defeat Sweden in the tournament final on Sunday. "It was great to win the tournament but to gain promotion is massive," he said. The Isle of Man qualified for the semi-finals after finishing runner-up to Sweden in their group. They then went on to defeat an unbeaten Israel side in the last four before thrashing Sweden by eight wickets to claim victory. Dawson said: "It was strange really - the final was probably our easiest game. "Our objective was to gain promotion and it felt like the weight had been lifted of our shoulders and we could really relax and play our best cricket." The Manx side will now play in next summer's Division One competition, with the chance to qualify for the World Twenty20 qualifiers. Dawson continued: "This is the biggest thing that has ever happened to Manx cricket. We have moved a huge stride close to playing at the top level. "We now need to get some time on grass wickets and continue the hard work." This year Afghanistan and Ireland reached the main tournament via the ICC World Twenty20 qualifiers in the United Arab Emirates.